With an ever-increasing number of young families setting up home in Battersea, parents in this corner of south-west London have particular reason to be grateful that the weather this summer has been nothing short of glorious. We know it can be difficult to keep children entertained during the six-week summer break, so here are a few suggestions of things to do in and around Battersea whether it rains or shines. London as a whole is well known for its parks and green spaces, but sometimes that’s not enough to keep the young ones entertained. 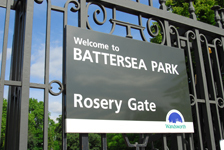 Battersea Park isn’t just a great place for the adults to relax, it also has two areas specifically designed for children. The first is an adventure playground which can keep youngsters aged five and over entertained for hours. And if your children are younger than five, the park provides a toddlers’ playground that is suitable for children up to seven years old. Did we say that the weather has been perfect for outdoor activity so far this summer? We’re keeping our fingers crossed that the sun will keep shining, but just in case indoor entertainment becomes the order of the day the Pottery Café on Northcote Road is a perfect venue. The café, which opened in July 2011, is ideal if you want to meet up with friends for a chat over an expertly made cup of tea, safe in the knowledge that children will be creatively absorbed decorating their own pottery pieces or taking part in competitions. The café also has a great selection homemade cakes and biscuits for you to enjoy. For those of you with a newborn baby, why not try your hand at baby feet painting? Print your little ones' hands or feet on any item of pottery, from tiles and mugs to dinner plates, and you can come away with an adorable piece to always remind you of this special time in your life. While the sun is shining, parents in Battersea seeking outdoor entertainment should travel a couple of miles up the road to Vauxhall City Farm. Just because you live in the city doesn’t mean your children should miss out on the opportunity to experience a slice of farm life. Vauxhall City Farm has all the sights, smells and sounds of rural life and a large selection of animals all waiting to meet you and your clan. From rare breeds of sheep and goats to horses, turkeys, rabbits and even two ferrets named Stinker and Jemima, these animals will delight your children and give you an unforgettable day out. And from 24 August, the farm will be offering individual and group horse riding lessons for both children and adults. And on 26, 27 and 28 August, Vauxhal City Farm will be running Own A Pony days for children aged between six and 16. The activities, which take place between 10am and 3pm, include grooming, feeding, mucking out, tacking up, stable management lectures and lots of riding. The organisers promise there will even be a rosette to take home. The property professionals at Eden Harper’s Battersea branch are experts in the local area. Not only can we find you a good quality family home to buy or rent, we can direct you towards the finest schools and nurseries and even point out GP surgeries, dispensing chemists and garages that carry out MOTs. For help with your property needs, contact Eden Harper today.